Welcome to the 2015 Golf Preview, where I’ll take a look at selected golfers and examine what to expect over the next twelve months. Today, we look at Graeme McDowell. At 23 years of age, Graeme McDowell won just his fourth start on the European Tour at the 2002 Scandinavian Masters and over the next six years, he became a fixture on the European Tour, picking up an additional three wins including the 2008 Scottish Open and playing well at the ’08 Ryder Cup, but it wasn’t until 2010 that McDowell became a superstar. After closing with a 64-63 weekend to win his fifth European Tour event in Wales, McDowell entered the 2010 U.S. Open at Pebble Beach as the 37th ranked player in the world and held the 36-hole lead before falling back to solo second after Dustin Johnson’s Saturday 66. Still though, McDowell was only three shots back and when Johnson imploded early on Sunday, losing six shots in the first four holes, McDowell held a one-shot lead and even though he stumbled a little bit on the back nine, McDowell was able to hold on to a one-shot win over France’s Gregory Havret. 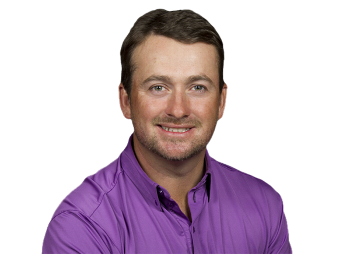 In the four years since, McDowell has won seven times worldwide and become known as a match play ace, with a 43-20-3 record in all formats along with being a key member of the winning side in each of the last three Ryder Cups. ESPN.com has a lot of great golf content, but their player headshots are, shall we say, a little outdated, with Ryan Moore leading the way. As such, I’m introducing the Ryan Moore headshot ranking system. Each player will get a ranking from 1-10, with 10 being the most outdated possible. Purple shirt, light beard and slightly awkward looking smile? Yep, that’s GMac. I always get this feeling that he’s going to look the exact same when he’s 50 years old. If you’re a golf fan, you should be able to find something that makes you smile from McDowell in just about every round that he plays. McDowell doesn’t have the prototypical “beautiful” swing like an Adam Scott or Louis Oosthuizen, but there’s something about his move to the ball that I’ve always loved. The combination of the little hitch on the way down and his Palmer like finish at the top gives him a little something extra that you just don’t see from the cookie cutter swings of younger players on tour these days. Where does McDowell go from here? McDowell’s in a very interesting spot as one of those players who still pretty much splits time between the PGA and European Tour, which is a big part of the reason he has only one PGA Tour win outside of that 2010 U.S. Open, and even though he had a sneakily good 2014, it still feels like there’s more to McDowell’s game than he’s shown to date. Admittedly, you’re in a good place if you can finish in the top-10 in half of your starts and still have people like me questioning your success, but it really just seems to me that a player of his ability in every aspect of the game, should probably be in the “multiple winners per year” group. Regardless, McDowell’s one of the best players in the world and doesn’t take himself too seriously. We’re lucky to have him. McDowell is one of my picks to win a Major in 2015! What do you think, Adam? I can see it happening for sure. Probably not Augusta because I don’t think he’s long enough, and he’s a little too reliant on hitting a cut these days, but I can see him grabbing one of the other ones.